Scaling and root planing or “deep cleanings” is the process of removing toxic bacteria and tartar from beneath the gum tissue. Your dental professional will utilize local anesthetic to keep you comfortable during your appointment. Your hygienist uses various instruments to clean the tartar out of pockets and smooth the root surfaces of the teeth. 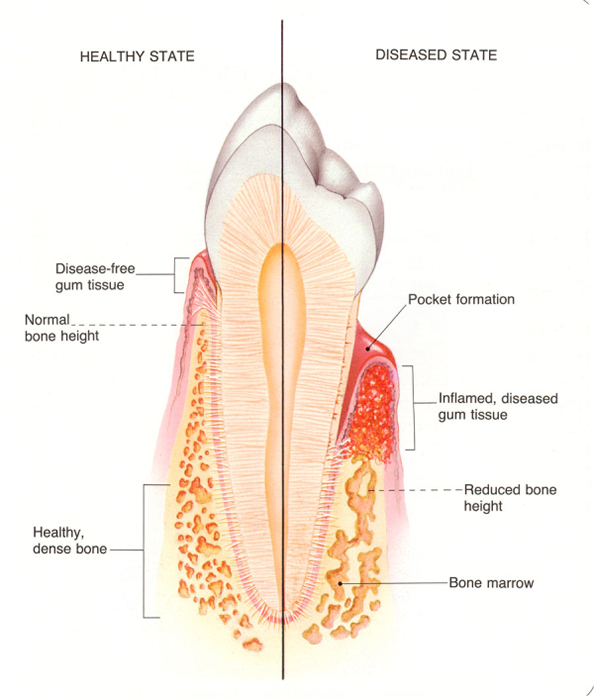 The root surface needs to be free of debris and bacteria to allow the gum tissue to begin healing. Sometimes your dental professional will recommend an antibiotic treatment to help speed the healing process. After the deep cleaning is completed, regular maintenance is necessary to keep the gum tissue healthy and from reverting back to the diseased condition. The bone never grows back to the normal level but, with excellent home care and regular perio maintenance, we can prevent the bone level from deteriorating further. Some post operative tenderness can be expected due to the extent and location of the procedure. Since the procedure is so time consuming, we have to split the cleaning into obtainable sections. Typically we can schedule the cleaning in two appointments at ninety minutes each.